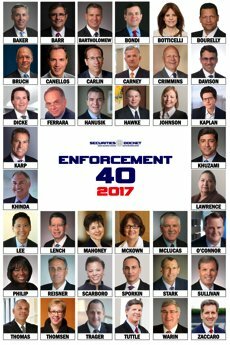 On Thursday, October 26, 2017, Securities Docket announced its new “Enforcement 40”—our list of the 40 best and brightest securities enforcement defense lawyers in the business. Bruce Carton, Editor of Securities Docket, announced the names of this year’s Enforcement 40 at the conclusion of Securities Enforcement Forum 2017, held at the Mayflower Hotel in Washington, D.C. The lawyers in the Enforcement 40 for 2017 are from many of the top law firms in the world and have been key players—both in the public eye and behind-the-scenes—in the most significant SEC enforcement matters over the past few decades. The Enforcement 40 for 2017 is the first update to Securities Docket’s inaugural list that was published in 2013.